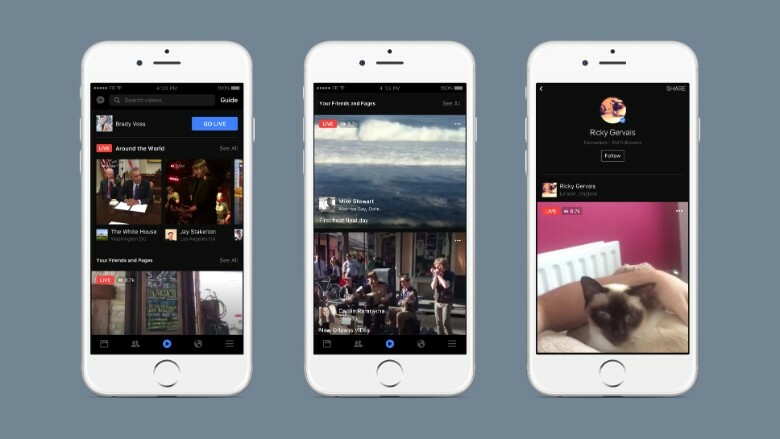 Love it or hate it, Facebook's live video streaming is a hit. It lets you tune into a cousin's wedding from halfway around the world or watch Martha Stewart bake cookies. Launched widely in late January and now available in 60 countries, the feature lets anyone broadcast a live video on their Facebook news feed from a smartphone. It's available to regular users, but has been particularly appealing for media companies, famous or wannabe famous people and brands with robust followings on Facebook. On Wednesday, the company will give Facebook Live a major promotion with its own dedicated shortcut on the bottom of its iOS and Android apps, replacing the current link to Facebook Messenger. Live videos will also get a new landing area on Facebook so people can find current and past live videos. Desktop users will be able to view a map of the world showing current live broadcasts. Facebook (FB) is also adding a number of new bells and whistles to make live videos more appealing for broadcasters and viewers. Users will be able to broadcast a video specifically to a Facebook group or event. Facebook imagines this being used for family gatherings or Q&A sessions. Viewers will be able to leave real-time animated reaction comments like "Love" and "Wow." All comments will be included in replays for anyone who missed seeing strangers weigh in on Martha's baking skills. Broadcasters on iOS can tinker with videos using filters and, in the near future, live doodle directly on a video. Facebook is pushing the expansion hard, and Mark Zuckerberg himself is lending a hand. The Facebook CEO will streaming on Wednesday morning to promote Live.